Beautiful Victorian Quality Solid Silver & Scottish Banded Agate Bracelet, 1880s. Here is the most beautiful victorian quality solid silver & scottish banded agate bracelet. The bracelet measures approx nine inches all the way round & each section measures half an inch by one inch with a depth of half an inch and its all set in solid silver, although not marked where i can see, tested & guarranteed victorian solid silver. The bracelet consists of six sections which are all lozenge shaped with faceted shaped sides and are all inset with real scottish banded agate. The agate is encased in solid silver to either end which on alternate sections has lovely early chasings to it. The agate is just superb, all origional scottish banded agate with lovely colouring & specimen type sections of agate with a fabulous variety and really good strong banding and nicely polished. The bracelet comes complete with a lovely early victorian large heart padlock clasp working well and one side with lovely early chasings and the other with a scottish flat cut polished green agate. This bracelet is totally origional to the victorian period of around the 1880s when scottish jewellery was at its height and this really is a fabulous origional example of this which is getting harger to find these days and as with age, this bracelet has been glued at some stage back into one of the mounts, which is fine, but it shows the glue marks, so this doesnt detract but is just mentioned for total accuracy. However this really is a beautiful victorian bracelet in good origional complete condition, that looks so lovely worn and most certainly will not disapoint and a fabulous example of these. I love antique jewellery, so hope that you to can appreciate my items, that have been pre loved with history. The item "Beautiful Victorian Quality Solid Silver & Scottish Banded Agate Bracelet, 1880s" is in sale since Sunday, November 30, 2014. This item is in the category "Jewellery & Watches\Vintage & Antique Jewellery\Vintage Fine Jewellery\Victorian (1837-1901)". 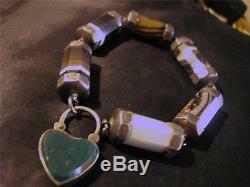 The seller is "dragonheartantiquejewellery" and is located in South West. This item can be shipped worldwide.